Published April 4, 2019 at 8:39 a.m.
CROSS CITY -- The Dixie County Chamber of Commerce Airport Event Committee has announced the slate of performers scheduled for the Entertainment Stage at this year's Fly-In, Cruise-In and Business Expo to be held at the Cross City Airport on Saturday, April 27. The Dixie County Chamber of Commerce’s Expo highlights business interests in the Dixie County area. This family-friendly event is FREE and open to the everyone. Entertainers performing for this year's event include Jamey King, Kerry Gordon, Krista Campbell and Billy Miller. The Entertainment Stage comes alive with performers starting at 10:30 a.m. that Saturday at the airport, with each artist performing a one-hour show starting at the half hour. The stage has been relocated for this year's event to a covered stage area under the big oak tree, just before the TrailRiders Club, on the right, as expo-goers approach the airport on 241st Street (also known as Airport Road). Jamey King (seen above) is one of the busier performers working the area's pubs and lounges from Perry to Gainesville to Cedar Key. This singer-songwriter (and Dixie County native) spent several months working with his band, Memphis Belle, a few years back playing to packed houses every night at the world-renowned honky tonks on lower Broadway (like Tootsie's and Legends) in Music City USA: Nashville, Tennessee. Kerry Gordon Sr. (seen above) has been performing primarily as a solo artist. Audiences have enjoyed his talent most recently, mainly at the tiki bars, restaurants, and pubs of Cedar Key. For this show, Gordon will be accompanied by Michael "Goose" Goodrich on electric guitar, who produced Kerry's most recent CD release titled "The Country Side" at WildBean Recording Studio of Old Town. Many people will recall Kerry's tenure with his brother Rick in the Gordon Brothers Band, and old-timers may remember his longtime run with the group Gordon Clay. Krista Campbell (seen above) performs at the Putnam Lodge Hotel and Spa in Cross City on weekends in the cocktail lounge-restaurant, where she has been seen for several years now. This gifted singer is renowned for her incredibly huge library of musical stylings from many eras and genres. A native of Detroit, Michigan, Campbell has been performing in the area for many years now. She calls Dixie County home. Billy Miller, a native of the Gulf-side Town of Suwannee in Dixie County, will open the day's entertainment lineup. Miller performs mainly in Suwannee and Horseshoe Beach, and compared to the other acts, is a relatively new performer on the scene. But like the aforementioned others, he too enjoys a most favorable critique from his audience. Dotti Leichner holds the autographed guitar. Published Jan. 29, 2019 at 9:48 p.m. Updated March 30, 2019 at 11:39 p.m.
OLD TOWN -- Dixie Music Center has donated yet another celebrity-autographed guitar to raise money for the Pee Wee Melton Memorial Scholarship fund. This latest instrument is an Ibanez acoustic guitar signed by multi award-winning Capitol Nashville recording artist Luke Bryan. Raffle tickets are available for a donation of $5 each, or $10 for three, and are available at Dixie Music Center, located at 26626 S.E. U.S. Highway 19 in Old Town. Only 500 tickets have been printed for this fundraiser. There are more than 300 remaining to be sold as of March 30. This scholarship WAS to be awarded by the Dixie Education Foundation (DEF), and the drawing for this great instrument is scheduled for Monday April 8 at the DEF meeting at the Dixie County Library at noon. A NEW DRAWING DATE HAS BEEN SET. THE WINNER WILL BE PICKED DURING THE DIXIE COUNTY CHAMBER OF COMMERCE FLY-IN AND EXPO ON APRIL 27. Luke Bryan is one of the top names on today's Country Music scene. His musical career began as a songwriter, penning songs for Travis Scott, Billy Idol, and Travis Tritt before signing to Capitol Nashville in 2007. His first nine album releases have included fourteen number-one hits. In 2013 Luke was awarded "Entertainer of the Year" by both the Academy of Country Music and the Country Music Association (CMA). To date, he has sold over seven million albums and 27 million singles worldwide. Pee Wee Melton was a legendary guitarist and producer who taught at Dixie Music Center in the 1990s. Many local guitarists start their musical careers with Pee Wee at DMC -- including Easton Corbin, who won Breakthrough Artist of the Year from the American Country Awards in 2010. Regional performing artist Jamey King also began guitar studies under Pee Wee's direction. The store's owners Bob and Dotti Leichner are proud to present these scholarships in memory of their late dear friend. Internationally known artists that have autographed guitars for the Pee Wee Melton Memorial Scholarship include Easton Corbin and Josh Turner. For the most recent Josh Turner guitar signing, the artist also donated a couple of tour T-shirts. For more information, please call DMC at 352-542-3001 or email to dixiemc@gmail.com. Published April 18, 2019 at 11:19 p.m.
YANKEETOWN -- The Education Center at the Withlacoochee Gulf Preserve (WGP) was closed this month due to septic problems. A meeting has been scheduled for April 29, at 6 p.m. at Yankeetown Town Hall, 6241 Harmony Lane, to discuss this problem. The WGP Education Center is the venue for many of the programs and outreach events at the Preserve. For example, the recent Yankeetown School fourth graders visit to the Preserve made use of the building. The Friends of the WGP appreciate investment in the Preserve. Any person who wishes to offer input, is asked to please come to the meeting on April 29 at Yankeetown Town Hall. Individuals’ ideas for fundraising, grant possibilities, and other solutions may be useful in solving this problem. Published March 28, 2019 at 7:09 a.m.
OCALA -- The College of Central Florida’s Visual and Performing Arts Department will present a chamber music concert Sunday, April 28, at 3 p.m. at the Webber Center, Ocala Campus, 3001 S.W. College Road. The annual spring chamber concert features the Saxophone Ensemble, under the direction of Gregory Snider; the Trumpet Ensemble, led by Andrew Moore; and the Percussion Ensemble, led by John Wallace. Light refreshments will be served. “The concert offers audiences a mix of CF ensembles and instruments in the intimacy of the conference center at the Webber Center. Come out to enjoy the music,” said Dr. Sarah Satterfield, professor of music for the Visual and Performing Arts Department. Published April 16, 2019 at 4:39 p.m.
STEINHATCHEE -- Jena Library Tech Center, part of Dixie County Public Library, will host its first Spring Fling Art Festival from 10 a.m. to 3 p.m. on Saturday, May 4, at D-TRAC Park, adjacent to the library at 4562 Highway 358. "As an ongoing effort to provide enrichment in Dixie County, Jena Library is proud of our local talented vendors and is so excited to have them here offering original artwork and craft items," Jena Library Tech Center Manager Alexis D’Orsi said. "What a great opportunity to support local artists!" With Mother's Day coming up, vendors can fill the shopping needs of patrons of the arts. There is barbecue for lunch, Ken's Kettle Corn, ice cream, fresh veggies, fruit, and preserves, honey, games, raffle, Cake Walk and more – and that’s in addition to arts and crafts! Picnic tables and a playground are on the site. Everyone is invited to this art-oriented family-friendly event. For more information, call Alexis at 352-498-1344 or 352-562-2793. Publish April 11, 2019 at 4:29 p.m. Updated April 18, 2019 at 7:39 a.m.
BRONSON -- Among April's happenings at the five library branches of the Levy County Public Library System will be a String Art Event. The library will provide all of the materials needed for each family to create a Family Heart String Art wooden hanging. The events will be limited to the first 10 families that register at each branch. For more information or to register for the program, please contact your local librarian. Bronson Public Library Monday, April 22 at 5:30 p.m.
Williston Public Library Saturday, April 20 at 3:30 p.m.
Cedar Key Public Library Monday, April 29 at 5:30 p.m. This project was funded under the provisions of the Library Services and Technology Act from The Institute of Museum and Library Services. Florida’s LSTA program is administered by the Florida Department of State's Division of Library and Information Services. Published April 20, 2019 at 9:08 a.m.
LEVY COUNTY – The United States Coast Guard Auxiliary (USCGAUX), District 7, Division 15 (Florida's Nature Coast), Flotilla 15-2 has planned events for National Safe Boating Week in Levy County. National Safe Boating Week (NSBW) this year is May 18 through May 24. This is the traditional kick-off of the recreational boating season. During this week, there is an emphasis on boating safety, boating education, and especially wearing a life jacket. The first event has happened. Leaders in the City of Cedar Key declared on April 16 its support of NSBW. Events in Inglis and Yankeetown to are to be determined, according to the USCGAUX as of April 20. Publisher’s Note: All events are listed chronologically. Please email announcements to hardisonink@gmail.com. Please look ahead on the Calendar and RSVP if the organizer requests that. Please check daily. Things change. If you do not see a notice that was sent, please send it again. Include a name and address when submitting events, so we can confirm them and so people can contact the sender for more information. TO SUBMIT AN EVENT, PLEASE SEND AN EMAIL TO hardisonink@gmail.com. Please include the date, time and place. Please note if it is free and open to the public. Please note if reservations are required. Please provide a contact method for people who want more information. 7:30 a.m. until sometime After Noon – The Wild Hog Canoe And Kayak Race takes place on Florida’s famous Waccasassa River and brings canoeists and kayakers through the heart of Florida’s back country. Sightings of deer, wild boar, alligators and all types of snakes are a frequent occurrence for race contestants. The race covers 15 miles of twists and turns and the current rainfall amounts can have a dramatic impact on the river, adding to the challenge. The race starts at the Waccasassa Bridge, six miles west of the stoplight in Bronson on State Road 24. It finishes at U.S. Highway 19 at the Waccasassa Bridge, 6 miles south of Otter Creek. Registration opens at 7:30 a.m. on race day on State Road 24 at the Waccasassa Bridge, and ends promptly at 9:15 a.m. Rule Review will begin at 9:15 a.m., and the race will start at 9:30 a.m. 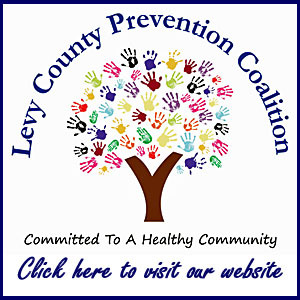 This even generates money to help the Levy County Association for Retarded Citizens (LARC). At the finish line for the race, there is food and fun in a family-oriented environment. This is where participants end their race, and it is where supporters have fun while enjoying the event. It is open to the public. 9 a.m. to 2 p.m. -- A Healthy Living Fair is scheduled to be at Epperson Park, on East Noble Avenue between Fifth Street and Sixth Street, in Williston. Hosted by the Ministerial Faith Alliance, this event promises to include fun and games; races; prizes; make-and-take crafts; organic and natural foods and other products; mini-classes by local the providers of programs and activities; plants and seedlings; information on backyard gardening; information on healthy living and lifestyles; and more. This event is free for the entire family. For more information, call 352-538-4474 Monday through Thursday from 9 a.m. to 2 p.m., or send an email to mfalliance32696@gmail.com. 10 a.m. - 3 p.m. -- The Dixie County Chamber of Commerce invites everyone to the Annual Fly-In, Cruise-In and Business Expo at the Cross City Airport, 508 N.E. 241st St., in Cross City. Admission is free. There are vendors of food, drinks and crats. Musicians are going to be performing. Parachutists are scheduled to drop from the sky. There are plane rides and helicopter rides scheduled to be available for a fee. There are going to be military displays, radio-controlled aircraft and other aircraft demonstrations. Cars, trucks and bikes will be on display on the ground. Baloon rides are slated to be from 7:30 to 10 a.m. The gates open for the general public at 9 a.m. Opening ceremonies, including the parachute jumpers is set for 10 a.m. For exhibitor of vendor information, please call 352-498-5572 or send an email to promotedixie@gmail.com. 9 a.m. - 3:30 p.m. -- Dixie County Chamber of Commerce is hosting LifeSouth Community Blood Centers’ bloodmobile at the Cross City Airport, 508 NE 241st Street, Cross City as part of the Dixie County Fly-In Cruise-In and Business Expo. To donate, a person must be 17 or older, or 16 with written parental consent, weigh at least 110 pounds and be in good health. A photo ID is required. For more information, call toll-free 1-888-795-2707 or visit www.lifesouth.org. All donors receive a recognition item and cholesterol screening. 7 p.m. -- The College of Central Florida’s Visual and Performing Arts Department will host “Sing, Sing, Sing,” a jazz concert Saturday, April 27, at 7:30 p.m. in the Dassance Fine Arts Center at the Ocala Campus, 3001 S.W. College Road. Doors open at 7 p.m. Enjoy the classics of swing band music juxtaposed against contemporary percussion compositions. The CF Percussion Ensemble, directed by John Wallace, will open the event and be featured in multiple collaborations with the Jazz Band. Additionally, enjoy the intricacies of jazz in the combo setting with the Patriot Blues Jazz Combo. This group directed by Greg Snider specializes in improvisation and group musical communication and has composed specific music for this concert. Snider, a CF adjunct professor for saxophone, clarinet and jazz, directs the jazz band, jazz combo and saxophone ensemble. He was recently awarded a master’s in music education with a focus on jazz studies from the University of Florida. He holds a master’s in music in saxophone performance, also from UF. Wallace has been a Visual and Performing Arts Department percussion adjunct professor since 2015 and is director of the CF Percussion Ensemble. He started his musical education at CF and transferred to Florida Southern College where he earned a bachelor of music and later a master of music from the University of Florida. Most recently, Wallace has become a principal percussionist with the Imperial Symphony Orchestra in Lakeland. He plays professionally with the Florida Orchestra, Brevard Symphony Orchestra, the Gainesville Orchestra and other professional orchestras throughout Florida. Admission to the concert is $12 for adults, $6 for non-CF students. CF students, faculty and staff are free with valid ID. For tickets and more information, call the CF Box Office at 352-873-5810 or visit tickets.cf.edu. The box office is located in the lobby of the Fine Arts Center and is open from 1-4 p.m. and an hour before show time. 3 p.m. and 6 p.m. -- The College of Central Florida will hold its spring 2019 commencement Friday, May 3, with two ceremonies to honor graduates. Both ceremonies will be held at First Baptist Church of Ocala, 2801 S.E. Maricamp Road. Tickets will be required for guests to attend and live streaming of the ceremony will be available. At 3 p.m., students receiving certificates, Associate in Science and bachelor’s degrees will be recognized. The second ceremony, for students receiving an Associate in Arts, will begin at 6 p.m. For the second time in CF history, tickets will be required for guests to attend the ceremonies to ensure adequate seating for everyone. For four years, CF has split May graduation into two ceremonies to accommodate the greatest number of guests possible. Each graduate who attends the ceremony will receive at least four tickets, and additional tickets may become available as students turn in those that they will not use. Since 2013, CF’s spring graduation ceremonies have been held at First Baptist Church of Ocala, the largest indoor venue in Marion County. “We take great pride in the accomplishments of our graduates and look forward to commencement ceremonies,” said Dr. Jim Henningsen, CF president. “Every graduate deserves the opportunity to have someone in the audience to celebrate their achievement. We wish that we could allow an unlimited number of guests, but safety codes limit our capacity. Tickets are the most equitable way to ensure each graduate has someone in attendance.” In addition to student speakers, the commencement address will be delivered by Kevin Sheilley, President/CEO of the Ocala/Marion County Chamber and Economic Partnership. John S. and Shirley B. Rudnianyn will receive the Distinguished Alumni Award. 1-4 p.m. -- There is a fundraiser scheduled for the Wounded Warriors Project. Registration starts onsite at 1 p.m. It is named Dr. J's Bootcamp. It is really a "boxing in air" fundraiser for the Wounded Warriors project. The bootcamp is scheduled to take place at the Ornan Masonic Lodge, 250 N.E. Sixth Blvd. (State Road 121), in Williston. The cost is $10 per person. One hundred percent of the proceeds go to the veterans in the Wounded Warrior Project. This bootcamp is open for women and men, girls and boys, aged 14 years and older, with no upper age limit. There is no contact - just fun. There is no experience needed. There will be fitness tips, footwork drills, pad work (optional), and combination drills. There will be opportunities to build mental strength. The list of things to bring to this bootcamp are water, a yoga mat, boxing gloves (optional) and a big smile. The drill instructor is Dr. J. Heines, a professional speaker, a physicist, an author and a fan of Japanese Jujitsu. Updated March 22, 2019 at 9:09 A.m. Following are the regular monthly days, times and places for senior citizen to visit with a SHINE representative. SHINE can help elderly people with information about insurance. SHINE volunteers provide health insurance information and free, unbiased, and confidential counseling assistance to Medicare beneficiaries, their families, and caregivers. 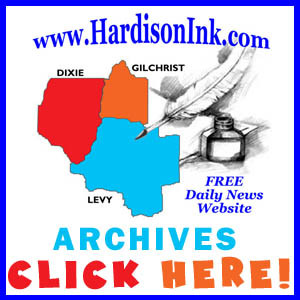 * Dixie County Public Library (in Cross City) - Fourth Wednesday each month from 1:30 to 3:30 p.m.
* Town of Bell Community Center - Third Wednesday monthly from 10 a.m. to 12 p.m.
* Gilchrist County Public Library (in Trenton) - Fourth Wednewsday monthly from 10 a.m. to 12 p.m.
* Levy County Public Library (in Bronson) - First Wednesday monthly from 1:30 to 3:30 p.m.
* Chiefland Senior Center - Third Wed monthly from 1:30 to 3:30 p.m.
* Levy County Public Library (in Williston) - First Wednesday monthly from 10 a.m. to 12 p.m.
* A.F. Knotts Public Library (in Yankeetown) - Second Wednesday monthly from 10 a.m. to 12 p.m. Updated Feb. 23, 2019 at 7:09 a.m.
12 p.m. – The Gilchrist County Rotary Club in the Gilchrist County Woman’s Club, 819 S.W. CR 339 (except on federal holidays). The club also meets at Akin's Barbecue three or four times a year - on random Monday afternoons. And normally this club does not meet the first Monday of the month. Instead, they meet for a Breakfast Fellowship at 8:30 a.m. on the first Wednesday of the month. Then this club has a Board and Membership Business Meeting on the 2nd Monday of each month at noon. All Gilchrist Rotarians are invited. The rest of the month, these Rotarians meet for member-sponsored programs on Mondays at noon. All meetings are at the Woman's Club in Trenton -- except those random meetings in Bell. 6:30 p.m. -- The Williston High School Football Boosters' meeting is in the Williston High School Library. Meetings will continue year-round on the first Monday of every month. The public is welcome and encouraged to attend. 9:30 a.m. -- Williston's AARP Chapter 912 meets at Williston City Hall, 50 N.W. Main St., Williston. This group meets at 9:30 a.m. each second Monday from September (2018) through May (2019) for coffee and socializing. The meetings start at 10 a.m. Noon -- The Dixie Education Foundation meets the second Monday of each month at at the Dixie County Public Library, 16328 S.E. U.S. Highway 19 in Cross City. 7 p.m. -- The Suwannee Valley Players meet at the Chief Theater, 25 E. Park Ave, Chiefland. The players discuss things that relate to the theater and upcoming shows. Anyone wishing to attend is welcome and no acting experience is necessary. For more information, please leave a message by calling 352-493-2787 or email to SuwanneeValleyPlayers@gmail.com. 6:30 p.m. -- The Levy County Republican Executive Committee's monthly meeting starts with food and fellowship at 6:30 p.m., followed by the meeting at 7 p.m. at a new location for these meetings: The Gathering Table, 116 N Main St. (U.S. Highway 19) in Chiefland. Everyone is invited to come hear from county leaders who will explain what's happening now or in the future of Levy County. Every meeting has informative Republican ideas, information and plans for the future in the county, state and nation. 6-7 p.m. -- The Friends of ForVets Inc., which is the lead organization for the Camp Valor project at Otter Springs Park and Campground, has scheduled meetings at the Gilchrist County Public Library, 105 N.E. 11th Ave., in Trenton, on the last Monday of every month, except that there is no monthly meeting in December. For more information, please contact Debbie Destin at 352-215-5476. Everyone is welcome. Volunteers are needed. 11:45 a.m.-1 p.m. – Williston Rotary Club meets at the First Presbyterian Church, 247 N.E. First St., Williston. 10 a.m. - Noon -- A support group for grandparents raising grandchildren meets the third Tuesday of each month at First Baptist Church of Cross City, 16024 S.E. U.S. Highway 19, Cross City. Come join us for help, ideas and to be refreshed. Ideas are always appreciated for ways to help. You've got a tough job! Learn about school choices, stress relief and provide support to each other. Childcare is provided. For more information call Gigi 352-493-9183. 11 a.m. - Noon -- Tai Chi classes are being held Mondays and Wednesdays at First United Methodist Church of Chiefland, 707 N. Main St. Classes will be there up to the middle of December, minus Thanksgiving Week. This version of Tai Chi is for Balance Only and it can be done sitting in a chair if that would be more convenient for some. Please let us know if you are interested and you can call Gerry Jesk at 352-493-2842 and leave a message giving your name and phone number. 11:45 a.m. - 12:30 p.m. -- The Suwannee River Economic Council has a meal site in Williston open to people who are 60 years and older. Seniors will receive a hot, nutritious, balanced meal free of charge. Donations are accepted. It’s in Thompson Hall at St. Banabars Church on 521 N.W. First Ave. (Located 1 block behind old KFC building.) Please call 352-490-7055 ext. 1 by 9 a.m. on Wednesdays to assure there will be enough meals hot and ready to serve on that day. 12 p.m. – Chiefland Rotary Club meets at The Gathering Table, 116 N. Main St. (U.S. Highway 19) in downtown Chiefland. 12 p.m. – The Dixie County Rotary Club meets at the Cypress Inn Restaurant, 15568 N.W. U.S. Highway 19 in Cross City. 2 p.m. -- The Clover Squares of Levy County meets in the First United Methodist Church Fellowship Hall, 213 W. Noble Ave., Williston, if we have at least eight square dancers. During the summer please "Reply All" to our email by 9 a.m. on Wednesday to determine if we have enough dancers. To be added to the email list, of if you want to learn to dance, or have any questions call 352-528-3323. 7 p.m. -- The Youth Ministry Program Ignite 4:12 at Cornerstone Assembly of God continues from Sept. 18, to be each Wednesday. Director of Youth Ministry Chris Kirby said he looks forward to seeing young people come to this weekly event at Cornerstone Assembly Of God 1045 Sixth Blvd., in Williston. 10- 11 a.m. -- The first Wednesday of each month, interested individuals are invited to enjoy the "coffee club meeting," where Edward Jones Financial Advisor Kathryn Lancaster will discuss current updates on the market and economy in a relaxed, informal setting. This discussion is at the Edward Jones office, 220 N. Main St. (U.S. Highway 19), in Chiefland. Participants need to reserve a spot at the coffee club meeting by calling the office at 352-493-4948. 6:30 p.m. -- Toastmasters (Radiant Ridge Club) wants to help individuals with their speaking and leadership abilities. We do it by practicing, coaching and advising each other, in a non-threatening environment. We meet regularly on the second, fourth and fifth Wednesdays. Meetings are held at the First Baptist Church, Citrus Ave., in downtown Crystal River. Come visit us and see if you feel you would enjoy participating. We are always glad to have visitors. For more information on Radiant Ridge Toastmasters, please call Renate Wilms at 352-746-4598. 12 p.m. -- Every third Wednesday, there is a free community light lunch at Holy Family Catholic Church, 17353 N.E. U.S. Alt. 27 near Williston. Everyone is invited. For more information, please call 352-528-2893. 10:30 a.m. -- Rural food distribution is happening every Thursday at the United Methodist Church on the east side of U.S. Highway 19 about one block north of the traffic light in Old Town. This replaces the former distribution drop station that used to be at McCrabb Baptist Church. 12 p.m. – Suwannee Valley Rotary Club meets at Haven Hospice, in Conference Building, 911 N. Young Blvd., in Chiefland. 7-9 p.m. -- ForVets Inc. is holding Bingo games every Thursday night in the Spring Lodge at Otter Springs Park and Campground, 6470 S.W. 80th Ave., near Trenton, in Gilchrist County. 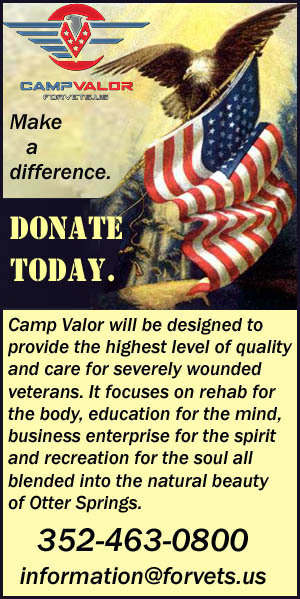 All proceeds from the sales of snacks and beverages goes toward the Camp Valor Project at Otter Springs. Bingo etiquett is required. Call 352-463-0800. 7 p.m. -- Yankeetown Inglis Woman's Club Bingo has restarted. The games begin at 7 p.m., in the club located at 5 56th St., Yankeetown. Stop in at 5 p.m. and shop in the Second to None Shoppe. At 6 p.m., you can eat before the games start. You don't have to play to eat, we have take out! There are always sandwiches and hot dogs available. For more information call 352-447-2057. 7 p.m. -- There is Bingo every Thursday at the Williston Lions Club, 401 S.E. Sixth Ave. Contact Pamela Vamosi at 352-222-8267 or Deanna Barnard at 352-283-8828 for more information about the Lions Club of Williston. 11:30 a.m. - 1 p.m. -- The Citizens For An Engaged Electorate conduct an open discussion and luncheon at Melanie's Restaurant 112 E. Noble Ave., in Williston. This meeting is free and open to the public. People who order lunch are responsible for paying their own bills for the food and drinks. This group discusses matters of public importance. 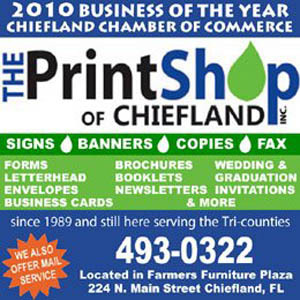 5:30 p.m. -- The Chiefland Lions Club meets the first Thursday of every month at 4 W. Park Ave. in Chiefland. For more information contact Lion Donna Maynard at 352-493-1006. 7 p.m. -- The Levy County Beekeepers Club meets the first Thursday of each month at 4 West Park Ave., Chiefland. Anyone who is interested in bees, or in beekeeping is invited. Beekeepers are ready to answer questions, share ideas and more. You need not be a beekeeper to attend. For more information, please call Byron Teerlink at 352-493-2216, or Chappie McChesney at 386-462-2637 or Leon Bath at 352-493-2329. 11 a.m. -- The Friends of the Luther Callaway Public Library meet each second Thursday of the month at the library, 104 N.E. Third Street, in Chiefland. The Friends support the Luther Callaway Public Library by promoting the library's programs through fundraising projects to augment the library's budget for the purchase of reading materials, books on tape, videos, operating supplies and minor equipment. Prospective members and guests are welcome at the meeting. Membership is free. For more information call Friends President Ann Brown at 352-226-7413. 11:30 a.m.-2 p.m. -- Cornerstone Assembly of God, 1045 Sixth Blvd. in Williston offers a free lunch each second Thursday. All are welcome. For more information, please call 352-528-6880. Noon -- The Dixie County Chamber of Commerce meets the second Thursday of each month at the Dixie County Public Library, 16328 S.E. U.S. Highway 19 in Cross City. 1:30-3:30 p.m. -- There is an Alzheimer's Caregiver Support Group that meets in the Edward Jones Conference Room at 220 N. Main St. (U.S. Highway 19), Suite 2, in Chiefland. This support group creates a safe, confidential, supportive environment or community and a chance for participants to develop informal mutual support and social relationships. Participants will learn and be informed about dementia, and the group as a whole helps participants develop methods and skills to solve problems. RSVPs are required. Call the Helpline at 1-800-272-3900 to reserve a seat or to find more information. The Gathering Table Restaurant in Chiefland. Arrive earlier for dinner. Are you interested in horses and trailriding? Join us for our monthly social and check us out at http://www.levycountyhorseclub.com/. 7 - 8:30 p.m. -- The Citizens For An Engaged Electorate conduct a business/action meeting at the Williston Community Center, 50 N.W. Main St., Williston. This is free and open to the public. This group discusses matters of public importance. 7:15 a.m. -- The Citrus Business Network (CBN) exists to grow the business and profitability of our members by providing leads and referral information, sharing marketing ideas and utilizing each others' services. Everyone wants to do business with people they know, like and trust. The CBN allows us to develop that kind of relationship, not only with other members, but also with friends and business contacts. We meet Friday mornings at 7:30 a.m. at the Twisted Oak Country Club, in Beverly Hills. Breakfast and social time begins at 7:15. We would love to have you visit a meeting and see if CBN is right for you. Questions? Call Peg Weston at 352-586-2343. 6-9 p.m. -- Everyone is invited to join the fun at a family-friendly event in Cross City on the first Friday of the month. This event is a party without drugs or alcohol. Every first Friday, the Dixie County Anti-Drug Coalition sponsors a family-friendly Friday Night Done Right from in the city park behind the Dixie County Courthouse in Cross City. Everyone is welcome to enjoy for music, games and dancing. The event itself is free, but there are usually concessions for sale by local youth organizations. For more information, or to host a Friday Night Done Right of your own, please call Debby Sweem 352-210-2601 or visit www.community-together.org/friday. 6-9 p.m. -- Everyone is invited to join the fun at a family-friendly event in Old Town. This event is a party without drugs or alcohol. Every third Friday, the Dixie County Anti-Drug Coalition sponsors a family-friendly Friday Night Done Right from at the 1st District Community Center in Old Town (9223 N.E. 349 Highway). This is on Highway 349 about 10 miles north of the light in Old Town. Everyone is welcome to enjoy for music, games and dancing. The event itself is free, but there are usually concessions for sale by local youth organizations. For more information, or to host a Friday Night Done Right of your own, please call Debby Sweem 352-210-2601 or visit www.community-together.org/friday. 8 a.m. -- The United Methodist Men of First United Methodist Church of Chiefland, 707 N. Main St. (U.S. Highway 19), hold a monthly breakfast meeting in the Fellowship Hall (basement) of the church in Chiefland. 9:45 a.m. -- C.A.N. (Community Alliance Network) meets at the Living Water Life Center (LWLC) 6491 S.E. 123 Terrace Morriston. We’re meeting to put together resources and ideas for growing, bartering, food storage, alternative energy and other forms of self-sufficiency. Join us to hear speakers from like-minded groups share their visions and help us form ours. We always look forward to meeting new people. 10 a.m. – First United Methodist Church of Chiefland, 707 N. Main St. (U.S. Highway 19), holds a food distribution at the pavilion across the street from the church as part of the Food For Life mission every second and fourth Saturday. A $3.50 donation is requested to help The Children's Table pay for diesel to pickup and distribute food. People who lack the $3.50 for the food are asked to volunteer some of their time if able. 4 p.m. -- There is a “Community Round Table Meeting” at Inglis City Halle each second Saturday of each month. This is an open forum for residents of Inglis to come together to discuss area needs and views. 5:30 p.m. -- Everyone is invited to a Gospel Sing on the third Saturday of each month at St. Johns United Methodist Church, on the corner of Alachua County Roads 236 and 239, in Alachua. The mailing address is 10708 N.W. County Road 236. There will be a sign at corner of the intersection. Each month, there will also be a fellowship afterward with a covered dish meal. 9 a.m. - 1 p.m. -- The South Levy Marketplace, which is held the fourth Saturday of each month, happens in the Food Ranch Plaza, 40 U.S. Highway 19 N., just north of Follow That Dream Parkway (Levy County Road 40). Vendors provide goods, demonstrations and services. There are even free cat adoptions. Vendor spaces and quality yard sale spaces are 10x10 for $10. Civic groups and non-profit groups can have spaces for free. For more information, call 352-302-1771. 1-3 p.m. -- The Care for Caregivers group meets on the last Saturday of each month in the Williston City Hall Community Center, 50 N.W. Main St. in Williston. Williston has support for caregivers and their loved ones who have dementia. LEVY COUNTY -- Rep. Charlie Stone (R-Ocala, Dist. 22) is scheduled to hold office hours on the first Tuesday of every month in Williston and Bronson, and the last Wednesday of every month in Chiefland and Cedar Key. This member of the Florida House of Representatives is the leader for constituents in Levy County and western Marion County. Williston: 1:30 - 4 p.m. The state representative is holding office hours in Chiefland and Cedar Key on the last Wednesday every month. Chiefland: 9 a.m. - 11:30 a.m.
Cedar Key: 1:30 - 4 p.m.